Welcome to another article in our series about Star Wars Galaxy of Heroes where we take a look at the best mods for individual characters. While I do not claim to have all of the answers in this game, I do my research and have used every toon I write about extensively. These are mod recommendations and they are certainly not the only option. However we look to help players maximize their characters in SWGoH and we are always open to feedback if you have a mod setup that works well of your gameplay. 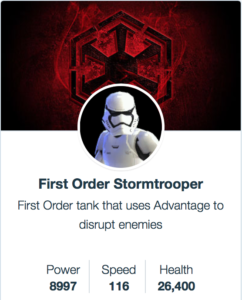 Today’s toon to review mods for will be the First Order Stormtrooper, a tank who taunts and can slow down opposing players with his basic attack, Hindering Shot. A decent farm, the FO Stormtrooper is available on Dark Side 2-A as well as Light Side boards 2-B. Main Focus: While every character needs speed (yes, I do say this every time because it is true), we will focus on that stat below. The purpose of having the First Order Stormtrooper in your squad is to taunt and protect your attackers, so the first are to focus on is survivability in the forms of Health, Protection and Defense – specifically I would focus on Defense first. Additional Areas to Focus: Critical Chance, Potency, Speed, Tenacity & more survivability. High Critical Chance is strategic advantage since a critical hit should the speed down debuff, however Potency is also needed to make it “stick,” and since he can land the Speed Down even on non-crit hits. Speed is always a good thing to have as you want him taunting, so Speed to help him get to his turn and Tenacity to help avoid debuffs are a good idea. Any additional Health and Protection gained from mods is a plus as FOST is one of those perfect toons for a mod with a +3 Speed and +1000 or more Protection in the secondary stats. In-game Mod Recommendations: Defense. Given the higher value of Defense mods and his Defense Up when he taunts, this is right in line with how I see FOST post Mods 2.0. I am choosing to go with a set of 4 Defense mods and 2 Health mods or simply 6 Defense mods to gain as much survivability as possible. Here are my recommendations for the Best Mods for FOST. 3 Comments on "SWGoH: Best Mods for First Order Stormtrooper"
While I usually agree with the mod choices here, I’m not thinking the suggestions for FOST are ideal. He’s not an attacker, he’s a tank. A lot of these mod choices seem to be trying to cover weaknesses, instead of amplifying strengths, which I’ve always considered a bad strategy. I’ve been using all health sets on mine, though defense is a good choice as well. Speed secondaries are essential as always, and some potency and critical chance is important as well, but I believe FOST’s primary responsibility on a First Order team is protecting the rest of the squad. I stack protection – primaries on the triangle, circle, and cross. This makes him able to take A LOT of abuse from the other team while taunting to protect FOTP, FOO, and Kylo – keeping them alive longer to keep things moving and landing big damage. I just saw it and responded. Apologies for the delay!